It is safe to say it has been a pretty good year for Connor Rozee. A member of South Australia’s National Championship winning Under 18 side, Rozee became a SANFL Premiership player while just 18, and then achieved his dream of being recruited by an AFL club when he was taken with pick 5 at last week’s AFL National Draft. 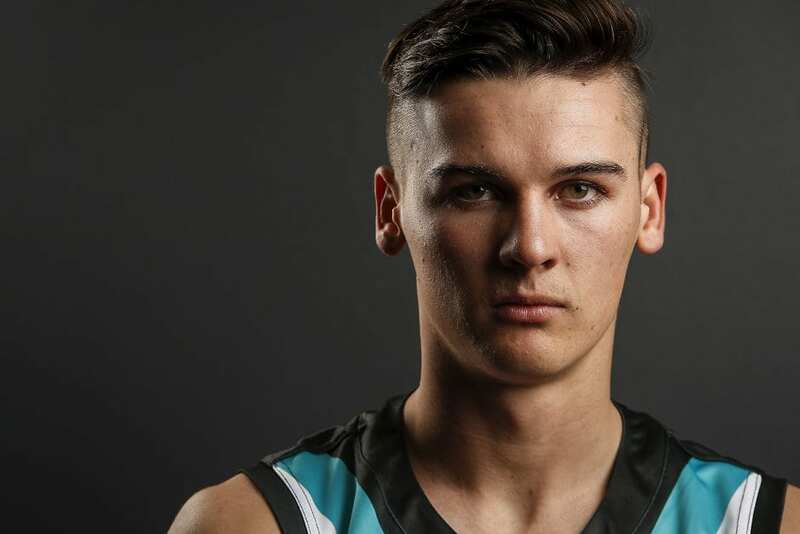 One of Port Adelaide’s newest recruits, Rozee played junior football with Port Augusta club South Augusta, where his father Robert was a premiership player, club champion and club coach. Robert Rozee also played SANFL football for South Adelaide. A speedy utility who rates his best position as in the midfield, Rozee is athletic, skilful, high-leaping and a strong mark. A St Kilda supporter, he was a chance to be selected by the Saints with pick 4, but slipped to the Power at pick 5, much to the delight of coach Ken Hinkley. But it wasn’t always looking likely that he would feature so highly in the draft order. In 2016, he won the Kevin Sheehan Medal as the best player of the Under 16 AFL National Championship while also winning South Australia’s Most Valuable Player award. In the final of that tournament, former North Adelaide and current Port Adelaide draftee Boyd Woodcock booted three goals. But his 2018 Under 18 championship was inconsistent and while six of his South Australian teammates were named All-Australian, Rozee missed out. He averaged 13 disposals per game but didn’t stand out as much as he had hoped to. After the championship, Power premiership player Josh Carr gave Rozee his opportunity to shine at league level in the SANFL. The North Adelaide coach backed the teenager to perform against men and Rozee repaid his faith with an impressive campaign including a couple of vital performances in the Roosters’ successful finals series. At the draft combine, Rozee finished in the top 10 for the standing vertical jump and running vertical jump tests and agility test and was second overall in the 20m sprint (2.91 seconds). If not an AFL footballer, the teenager suggests he would be a PE teacher – but that is a dream which can wait for now.